The 222 participants of the sixth annual Regional Burn Center 5K Run/Walk helped raise approximately $1,500, which will help fund the center’s education and outreach programs. Each year, the Regional Burn Center’s staff presents a wide range of educational programs for professionals, first-line responders, community hospital emergency rooms and nursing students. The staff also presents programs for the community on burn prevention. The program is custom fit to meet the community’s needs. Burney the Bear, the unit’s mascot, is frequently incorporated into the course content with his message on how to prevent fires and what to do should your clothing catch on fire. 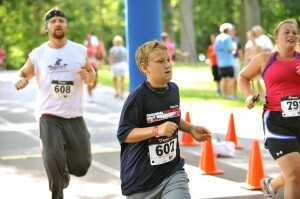 Former Burn Center patient Austin Bennett, 12, of Janesville, ran the 5K, held June 23 at Springfield’s Washington Park, with his uncle, Travis Bennett. Austin’s left leg was severely burned after a cup of gas spontaneously ignited in November. After three inpatient stays and a handful of outpatient visits and procedures, he is back to living an active, pre-teen lifestyle. Meet Austin in this short video that recaps this year’s Burn Run. To view photos from the Burn Run, visit MemorialBurnCenter.com or Memorial’s Facebook page at Facebook.com/MemorialHealthSystem. For information on the Regional Burn Center’s educational classes, please call 217-788-3325.